This tute will cover some specific uses of Screamer for fixing sound in wads. The program is best used in conjunction with Wadmerger. I am not going to cover installation, as that is thoroughly explained in the manual that comes with the program. However you should note that you must download and install the Java environment to run the program. What Screamer won't do. It will not create a sounds.txt from your current wad. What it can do: It allows you to create a new sounds.txt and output new .sam and .sfx files (sound files) for your wad. You can use it to create a new sounds.txt file for a single object or for a complete wad. It will allow you to add custom samples to an object. What's the point of doing this? Some of it is creative such as adding custom sounds, but often it is used as a corrective measure for wads with messed up sounds. There is also a huge buildup of unwanted sounds that get assigned to wads through objects being brought into a wad then being deleted. The average level probably uses 120 -160 sound samples, but wads often end up with 200 or more sounds associated with the wad during the building of the wad, as objects are added and deleted. When you compile your TR4 level file with tomb2pc.exe all these samples get added to the TR4 file. That can be mean about 2-3 Mb of unwanted rubbish being added to your TR4! My tip here is do all your experimental work with new objects in a test wad and project. Only add objects to your level wad when you are satisfied that they are working properly. In TRLE game sound samples are wav files in the format PCM 22,050 Hz 16-bit mono. You have a huge set of standard TR4 sounds to choose from in your Samples folder. You can add custom samples to this set of sounds. I recommend if you create new samples you stick to the 8-letter naming convention for the file and keep the sample smaller than about 70 kb otherwise it probably won't trigger in game. In the TR4 wad format there are 370 sound banks available (0-369). Think of these as channels on an audio mixing desk. These audio banks or channels are set with a predetermined name and number. With each of these sound banks you can associate (assign a sample) a sound sample or samples to it. Unlike the Sound banks themselves which are not changeable, you can change the samples that are assigned to each Sound Bank. This means that the four different Lara footstep sounds are assigned (associated) to Sound bank channel 0 - LARA_FEET. So these 4 samples will trigger alternately when Lara walks. 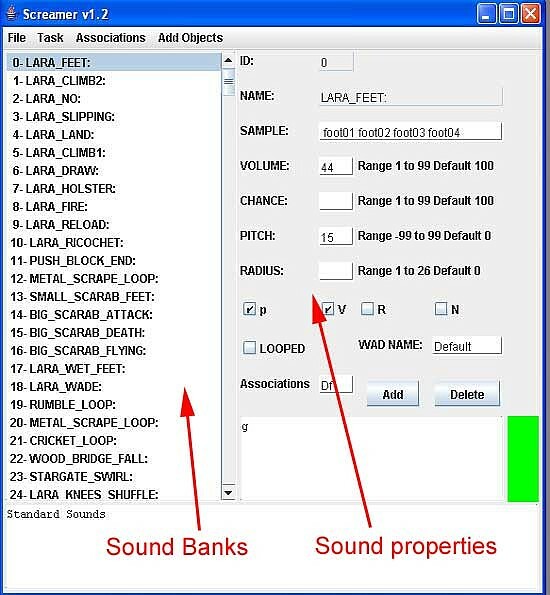 They will trigger where a sound trigger for Sound bank 0 has been set in the Anim Commands of the Lara wad object. You can view this in the Anim commands window of Wadmerger's Animation Editor. When the Screamer program window opens you are presented with 4 menus at the top. Below this are two frames. The left hand frame contains the list of 370 sound banks. You can scroll down through the entire list. The right hand frame contains all the sound properties and settings required to associate a sound sample and sound bank to a wad. Let's work through the different fields. ID: The Sound bank ID. This corresponds with the sound bank list. Nothing to do here. Sample: this is the name of the sample that is assigned to the current sound bank you are viewing. Notice if you click on a different item in the list, the properties change. If you are adding a custom sample to a sound bank this is where you would enter its name. Volume: This sets how loudly your sound sample will play in game. Chance: This sets how regularly a sample will be played. In most cases you'll want this set as blank (or default100 - same thing). E.g. it will play 100% of the the times it is triggered. If Chance was set at 95, the sample would play about 95% of the times it triggered. Pitch: this changes the pitch of the sample. A negative value will make the sample sound deeper and slower, a positive value will make the sample play faster and sound higher in pitch. Radius: This is the distance away from Lara that a sample will be heard. P V R N: Disregard these buttons, Their exact function has not been described. Looped: This is only applied to samples that are played continuously like the waterfall loop. Wad Name: This is where you enter the name of your wad. Associations: This is where you enter a 2-letter shorthand name for your wad. Add: Press this button to add a Sound Bank to your wad. (Note:Side panel is Green when associated). Delete: Press this button to delete a sound bank from your wad. (Note: Side panel is Red when not associated). Associations panel: This displays the shorthand wad names that are currently associated with the sound bank. Scenario: You have a single silent door object in a wad (let's call it testdoor.was) and wish to add sounds to it when it opens and closes. 1. Open your testdoor wad in Wadmerger. Click on your door and open the Animation Editor. On the Sound drop down menu go> Add Sounds. Scroll down the list to TR4 64 - DOOR_GENERAL and tick the check box and click Add Selected button. 2. Using the Current Animation drop down list to view the different animations - Select the 'Door opening' animation (you'll be able to see this as it goes through the animation) and open the Anim Commands button (The button with 0011 etc). In the first window select 'play a sound' from the drop down list. In the second window put '4' for the frame number you want the sound to start triggering. In the third window select '64 - DOOR GENERAL' and in the fourth window select 'Always'. Now click the 'Add' button. Repeat this step for the door closing animation. Now save your wad. You have now set the DOOR GENERAL sound bank to trigger whatever sample is associated with it on Frame 4 of both the opening and closing door animations. By default, that is the sample gen_door. 4. In the Wad Name field replace the word 'default' with 'testdoor'; in Associations field, replace Df with Td (It can be anything - I've chosen this for testdoor. Note: the letter combination: first letter uppercase, second letter lowercase). 5. Go to associations Drop down menu and choose 'Clear all except'. A message in the bottom panel tells you all associations have been cleared except Td. There are temporarily no sounds associated with your wad. 6. From the Sound Bank list scroll down to no.64: DOOR_GENERAL and click on it. This brings up the properties for sound bank 64. You can see that the sample assigned to this sound bank is gen_door. We'll leave it and the other settings as they are. 7. Click the Add button to add Sound Bank 64 to your sounds.txt. We're using this sound for both opening and closing the door so there's no other sound banks needed. Look at the Chance value. If it is not a blank field or a value of 100, change it to 100. This is to ensure that the sample plays every time the door is opened and closed. 8. Go to the Task Drop Down menu and select 'output wad'. Now look in the Output folder where Screamer is installed. You'll find two new files created here: testdoor.sam and testdoor.sfx. Copy them and paste them over the same named files that were created with the testdoors wad. 9. You are finished with Screamer for now, so using the 'Save As.' function, save your custom sounds.txt file (for future reference) to a folder with your testdoors wad. Scenario: You have built an level wad that you are using with your level. At some point your sounds have gotten messed up. Classic examples of this are: rolllingballs, levers and underwater switches with no sound; enemies that make underwater gurgling sounds then they shoot at Lara; Lara's gun sounds go strange or are missing. Cause of problem: Usually caused by too many samples in the wad, by an object being added to the wad that has a sound sample that isn't in your Samples folder, or an object that has TR3 or TR2 sound banks assigned to it. Solution: There is no simple fix for this. You have to get rid of the excess samples and/or Sound banks that are causing the problem. So you must create a new sounds.txt for your wad. Screamer performs the same function as pcwadsfx by creating a new sounds.txt and outputting new sam and sfx files for your wad. It just does it a lot more cleanly and and makes editing the sounds.txt file a lot easier. Preparation: You need to do some homework first. So get yourself a pen and paper and get ready to start writing lots of numbers. You need to make a list of all the Sound banks that should be associated with your wad. 1. The default General sounds that are used by all levels - this is Lara's sounds and basic environment sounds. 2. Sounds associated with enemies. 3. Sounds associated with other moveables (traps, levers, animating objects). 4. Sound banks that are hardcoded in the TR4 game engine (eg rollingball rumble, vehicle movement). This procedure may take about an hour, but don't be scared off - it is well worth the effort, as it will restore sounds correctly to your wad as well as reducing the size your TR4 output. So begin by opening up your wad in Wadmerger. (First save a backup of your level wad, was, sam, sfx and swd files in a safe location). 1. The General sounds we'll deal with in Screamer shortly. 2. Enemies sounds. Select your first enemy and open it in the Animation Editor. Select animation 0 in the Current Animations drop down list. Open the Anim Commands window (button with 0101 etc). Click on one of the lines of sound instructions (If there are no instruction lines in the window, you may have to select another animation). Now click on the arrow of the Sound Bank field (second field from the right). This will display a list of all the sound banks used for this enemy. Write them all down. E.g Baddy 2 - 95, 254, 258 64... Repeat this process for all the enemies in your wad. 3. Other moveables sounds. Work down the list of your wad items for all your traps, doing the same as you have done for the enemies, listing all sound banks that are associated with the item. As an aid I have created a list of commonly used items and the relevant sounds that need to be associated with them. (Note: this is not a complete list , but I will add to it as necessary). Check through your wad and/or the list to see which objects you are using in your level and write the relevant sound banks down in your list. Note: If you discover any enemies or objects that use sound banks from TR2 or TR3 (e.g.TR3Sound205) you may need to modify these otherwise they can cause problems in large wads. (See separate Tutorial - Changing Sound banks and samples). 4. Hard-coded sounds. There are some sounds that are hard-coded and these need to be added to your sounds.txt directly using Screamer. You're done with Wadmerger, so now open up Screamer. Let's assume your level wad is called 'mylevel'. You can substitute the real name of your level wherever this appears in the tutorial. 6. In the Wad Name field replace the word 'default' with 'mylevel' (don't include the quote marks); in Associations field, replace Df with Ml (It can be anything - I've chosen this for 'mylevel'. Note: the letter combination: first letter uppercase, second letter lowercase). 7. Go to associations Drop down menu and choose 'Clear all non G & T'. A message in the bottom panel tells you All association data for all sounds has been cleared except 'g' and 't'. There are temporarily only the standard game sounds associated with your wad. 8. Now using the list you just compiled, work through the list by clicking on each Sound Bank number in your list to select it, and then click the Add button, to add it to your wad. Repeat this process until all the sound banks that you have listed have been added. 9. You may also need to add any hard-coded sounds that are not on your list. This may include Rollingball sounds, or Vehicle sounds. Add them now. 10. You are now at a point where you could stop, but there is also the opportunity to be a bit creative and fine tune any of your sounds. It's a bit hard to list all possibilities but if any of your sounds are playing intermittently then change their Chance value to 100 so they play all the time. If any of your sounds seem too loud you could adjust the volume of that sound bank. If you would like a sound to be heard further away from its source than it is now then increase the Radius of the sound to achieve this effect. If you want to replace a standard sound sample with a custom sound sample you could do this by replacing the name in the Sample field. 11. Now do a Save As.. for your sounds.txt file in a unique folder to keep for reference, in case you need to do any other alterations to it later. You can open up this sounds.txt file with Screamer at a later date, if necessary. 12. Finally, go to the Task Drop Down menu and select 'output wad'. Now look in the Output folder where Screamer is installed. You'll find two new files created here: mylevel.sam and mylevel.sfx. Copy them and paste them over the same named files that were created with your mylevel wad. Now place your five wad files (was, wad, sam, sfx, swd) in your Graphics/Wads folder and compile your TR4. If you've done everything right, all your sounds should play correctly. You may also notice that your TR4 file size is significantly smaller (like about 2-3 Mb). Now play through your level, paying attention to hear if all sounds that you would expect to be playing are doing so when you expect them to play. There is always a chance that you missed something on your first attempt. If so, go back to your lists and double check what's missing from the offending item. Add the needed Sound Bank as you did for all others, resave your sounds.txt file and go Task > output wad again, replacing the current sam and sfx files of your level, with the new ones you have just generated in the Screamer/Output Folder. I'd call this Screamer tute an Advanced Tutorial. Hopefully it is useful to you. This tute assumes you have understood the preliminary Screamer Tutorials and are now looking to modify Sound banks and sound samples. This is only necessary with moveables that have TR2 or TR3 sound banks associated with them. (Note: Some builders have used these objects without too much problem. I have found that by the object adding extra TR2 or TR3 sound banks to the wad structure, that sound problems do arise, especially with large wads.) So consider this a recommended rather than essential method for sound-fixing. Scenario: You have an enemy that uses four TR3 sound banks and samples. Solution: The sample can retain it's name. Just ensure that it is the same sample format as TR4 - PCM 22,050 Hz 16-bit mono. The Sound banks can be replaced with TR4 sound banks and the TR3 sound samples can be assigned to the TR4 sound banks. Method: Save your object as a single object wad using Wadmerger. Let's call it 'mydog' wad. Open the object in Wadmerger's Animation Editor. Open an animation from the Current Animations list and also that has sound instuctions in it. Open the Anim Commands window (button with 01010 etc) to see the sound instructions. Click on the Sound bank field arrow to show the complete list of Sound banks used. Write these down. Using the Add Sounds button to open the Add sound window, now select suitable sound banks to substitute for the TR3 Sound Banks. For example, if you had a TR3 Hound in the Dog slot and it had four TR3 Sounds associated with it, you could choose four TR4 Dog Sound Banks as the substitute banks (E.g. 175_Dog Howl, 176_Dog Hit Ground, 180_Dog Bite, 181_Dog Death). Make a reference table list so you don't get confused. You want to list your four TR3 sound Banks, the four TR4 Sound banks that will replace them and the TR3 Samples that they use. (Remembering that a single Sound bank may have several sound samples assigned to it). Open Wadmerger's Sound Manager and click on each of your four Sound banks to establish which samples are associated with each Sound Bank. Use the Dropdown arrow on the Sound sample field to see if more than one sample is assigned to a Sound Bank. Returning to Wadmerger's Animation Editor, Use the Anim Commands window to replace (Change button) each TR3 sound instruction with your chosen TR4 Sound Bank. Work through every animation doing this. Save your wad. 1. When Screamer opens, it automatically loads a default sounds.txt. (Don't save over this - always use the Save As function). 2. In the Wad Name field replace the word 'default' with 'mydog'; in Associations field, replace Df with Dg (It can be anything - I've chosen this for 'Mydog'. Note: the letter combination: first letter uppercase, second letter lowercase). 3. Go to Associations Drop down menu and choose 'Clear all except'. A message in the bottom panel tells you all associations have been cleared except Dg. There are temporarily no sounds associated with your wad. 4. From the Sound Bank list scroll down to no.175_DOG HOWL and click on it. This brings up the properties for sound bank 175. You can see that the sample name assigned to this sound bank is dog_hwl. Change this to the sample that is in your table/list. - It might be something like TR3Sound205_0. If there is more than one sample to be assigned, simply leave a space and add the next one on the same line of the Sample field. 5. Click the Add button to add Sound Bank 175 to your sounds.txt. Look at the Chance value. If it is not a blank field or a value of 100, change it to 100. This is to ensure that the sample plays every time. If there is more than one sample you will need to adjust the Chance Value to create a random selection of which sample is played. Repeat this procedure for Sound Banks 176, 180 and 181. 6. Go to the Task Drop Down menu and select 'output wad'. Now look in the Output folder where Screamer is installed. You'll find two new files created here: mydog.sam and mydog.sfx. Copy them and paste them over the same named files that were created with the 'mydog' wad. 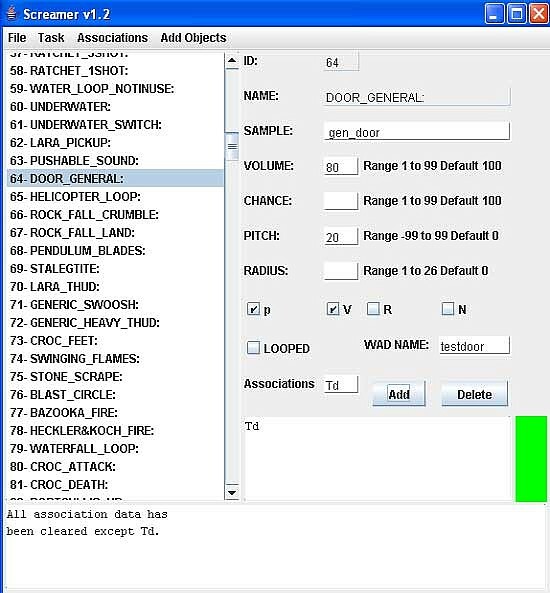 Use Wadmerger to add the enemy to a test wad and see if the sounds work correctly. If all has gone well - your dog will perform the correct sounds in game. 7. You are finished with Screamer for now, so using the 'Save As.' function, save your custom sounds.txt file (for future reference) to a folder with your mydog wad. Using the above tutorial it is easy enough to imagine that custom samples can be substituted for standard sounds for just about anything. Simply save the sound sample in your TRLE Samples Folder in the correct format - PCM 22,050 Hz 16-bit mono. Then replace the Sample Field name for the relevant Sound Bank with your custom sample name. Then Output your wad and replace the Sam and Sfx files as previously described. Reference Sound bank list for Commonly used Wad Items.